Why did Eneria take this initiative while you are exclusive Caterpillar dealer? This is a real opportunity. Since the acquisition of MWM by Caterpillar in 2012, we now have access to new gas and biogas products from Germany, even more relevant and effective, covering the whole range from 400 kW to 4,3 MW. But we wanted to meet another need identified: projects under 400 kW. We approached Tessari, whom we appreciate the business philosophy and concluded that collaboration protocol: Tessari buys the Man motor and integrate it. Eneria installs, maintains and provides guaranteed results. For our customers, the performance of Man engines combined to reputation of Eneria make the difference, our added value is the integration and profitability commitments. Our customers are looking for key products hands. We now offer a very wide range, starting at 60 kW, including full maintenance Eneria. 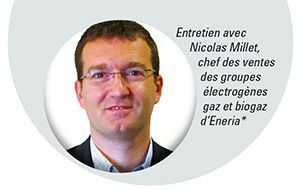 Here, we aim to standardize the product, the ability to fully cover the biogas market with over 15 years guaranteed results, unique offering in the territory. What is the strength of your maintenance service? Our difference is the availability, efficiency and reliability. Our 250 technicians located in the country over 100 people working in back end logistics. Our service offering is complete and our efficient customer commitment intervene everywhere in France in less than 4 hours, weekends and holidays compris. 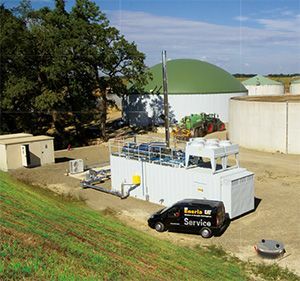 Eneria therefore covers all technical needs of biogas projects, coupled with exceptional service offering in the territory. Our customer, Labat company specializing in the collection and liquid waste management (drain fat from the food industry residues, sewage sludge) was ambitious to treat and recover these greasy waste by producing a biofuel derived from the anaerobic digestion (dehydration process and creation of organic fertilizer). What was the offer of Eneria? 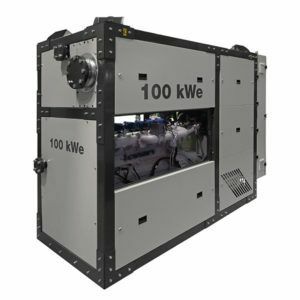 An effective solution integrating a biogas engine 600 kWe in containers with energy recovery. Eneria provides long-term support with a full service contract for 15 years. Choosing the recovery of waste meets the challenges imposed by climate upheaval. Share the post "New range of biogas engine of less than 400KW – MWM – Man engines"